What can visitors expect to find on your website? My site is a reference guide for JAJ Pyrex (from the UK) and Agee/Crown Pyrex (from Australia). It contains information relating to pattern names, dates of production, model/size numbers and pictures of the various patterns and models. In addition, it houses a range of digitalised original adverts and leaflets. What inspired you to start the site? There was a lack of information relating to JAJ and Agee/Crown products available. In fact, whilst many books have been produced on the original US Pyrex productions and some on JAJ, nothing has ever been made available for Agee/Crown. My site is the first to do so. 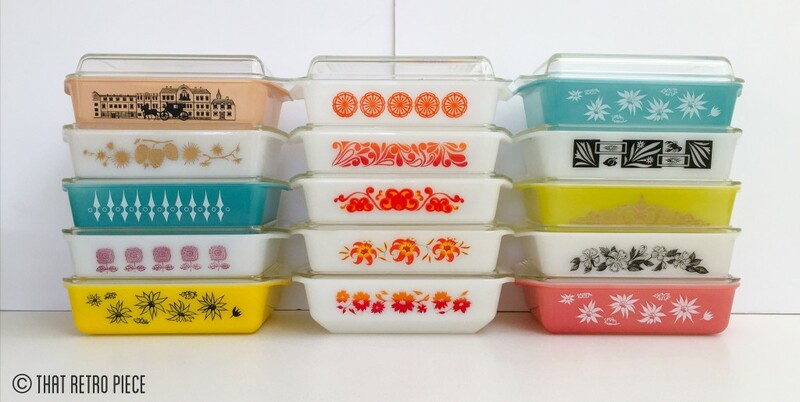 Why did you start collecting Pyrex? I’m an avid collector of many vintage items, from furniture and home-wares to many kitchen items. 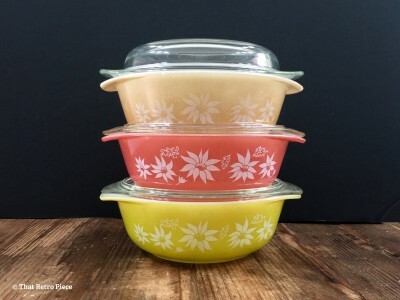 I’d always had a love of Pyrex through, its vast array of colours and patterns—that and the fact that it reminds me of my mother’s cooking! Do you have any plans to celebrate the Pyrex centennial on your site? 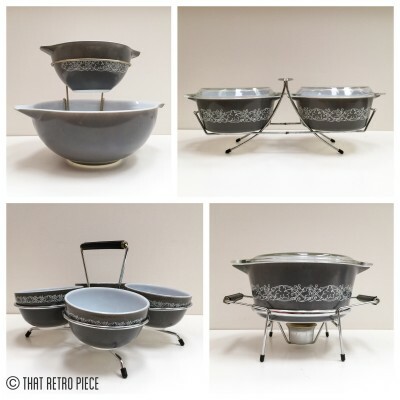 We’ve already started celebrating the centenary—I’m an administrator of a large Pyrex collectors group in Australia focusing on collecting and trading goods. Favorite pattern? Aargh—too many to mention. ‘Spring Blossom Green’ (version two) is my favourite US pattern, ‘Classics’ is my favourite JAJ pattern and it would be a tie between ‘Flannel Flowers’ and ‘Turquoise with White Spears’ as my favourite pattern from Australia. Favorite recipe to make in Pyrex? Gah, lots! Lasagne is a favourite… but maybe what takes the cake is my bread and butter pudding made with Nutella and croissants! You can find and follow That Retro Piece on Flickr and Instagram, and if you’re in Corning October 16-17, 2015 join us for the 54th Annual Seminar on Glass: Pyrex and Material Culture (www.cmog.org/seminar) where Stan will be presenting on International Pyrex. I make this in a round Pyrex #475 casserole (equivalent to 2.5L capacity), however you could make it in any size or style dish you prefer, simply adjust the measurements accordingly. An important note is that this also serves anywhere from 8-10 people. Yep, that’s a lot, but if there is any remaining from the initial serving, you’ll have some left over for the day after. 1. Preheat oven to 180 degrees Celsius (350° F). 2. For the custard mixture warm the milk, cream and vanilla in a saucepan over medium heat. Bring to a simmer and remove from heat. 3. Place sugar and eggs in bowl and whisk for about a minute or so. Add the hot milk/cream mixture and whisk until combined, then add Frangelico. 4. Cut croissants in half lengthways and spread Nutella on each side (as generously as you like – it’s really up to personal preference). Place croissants Nutella-side up in dish, then add dollops of ricotta on top. Repeat and for the final layer and presentation purposes, use croissant tops and place Nutella-side down. 5. Pour over custard, pressing down croissants if necessary to soak up the mixture. 6. Bake in your pre-heated oven for 35-40 mins or until brown on top. Looked for the puffy goodness of golden croissants! Serve with a generous dollop of double cream. America’s Favorite Dish: Celebrating a Century of Pyrex the exhibition celebrating 100 years of Pyrex brand glassware is on view at The Corning Museum of Glass through March 17, 2016. 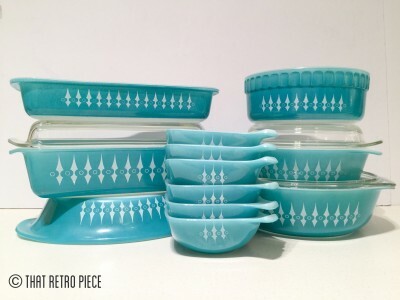 Explore everything Pyrex on Pyrex Potluck. See all Featured Pyrex Sites.